The one that I have is in the brown packaging which is to help with pores care. 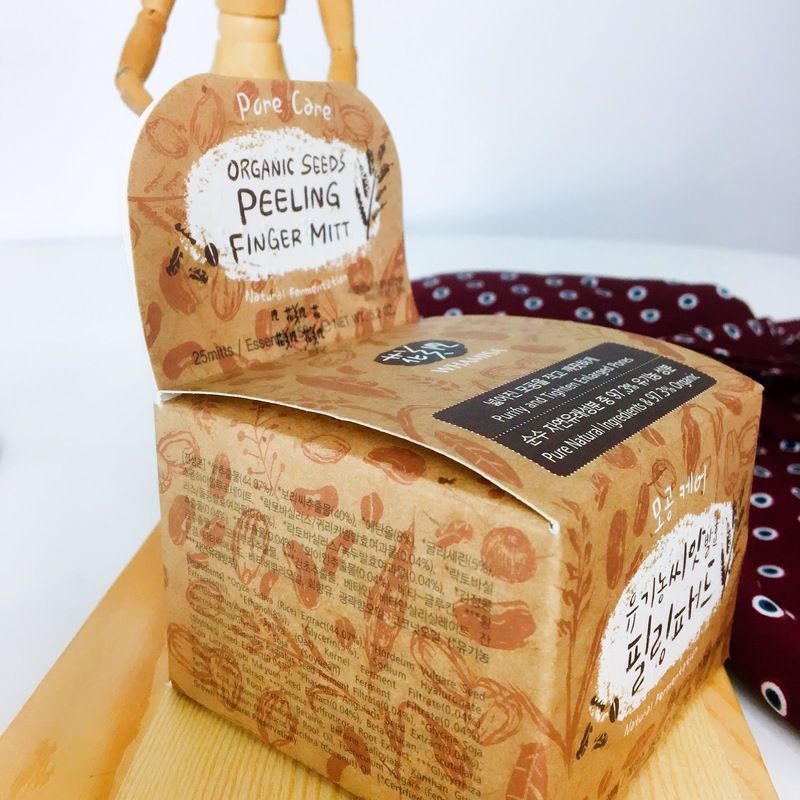 Packaging wise, it looks very similar to their other product which I thin resonates well with Whamisa's brand image that put emphasizes on using ingredients from nature. Each tub comes with 25 pieces of soaked mitts inside of it which is a bit too little in quantity considering that it is slightly pricey than some other peeling pads. I was hoping to have at least 30 pieces of them so if I use it every day, it'll at least last me for a month before I need to replenish the stash. I do know that sometimes price does reflect quality, so I decided to give it more time before going to further conclusion. 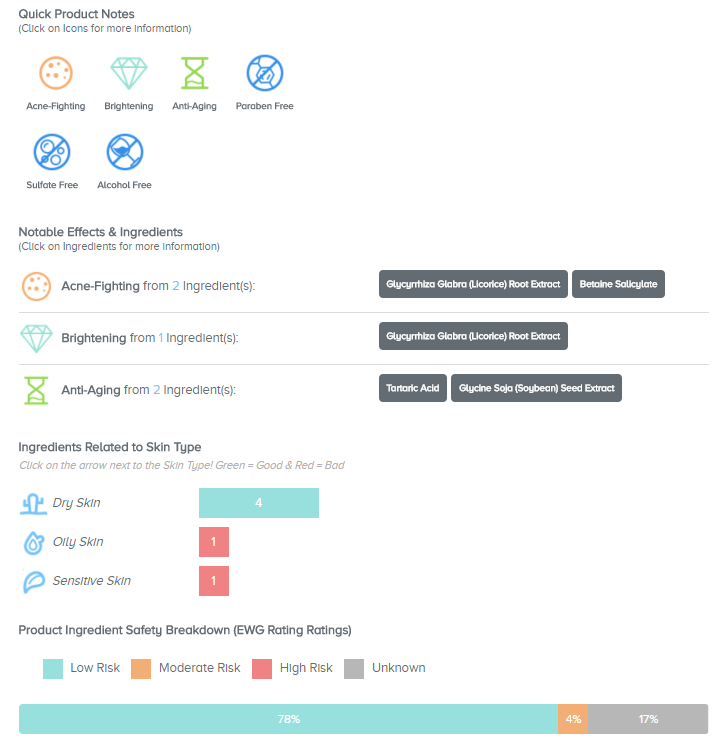 Looking at the ingredients list and crosschecking it with the EWG ratings (skincarisma.com), seems like all of them are under the green category which can be considered safe for the skin and posses a low risk of irritation. Some of the ingredients used also have an anti-ageing, anti-acne and brightening properties in them too. Although this product is suitable for any skin type, those with acne skin might want to take an extra precaution as it contains Coconut Oil that is comedogenic; which can potentially block pores instead. Meanwhile, the Tartaric Acid may cause irritation if used at high concentration especially for those with sensitive skin, so make sure you won't overdo it! On the bright side, for those with dry skin like me, this product contain fours ingredients that works wonder in hydrating the skin; Sodium Hyaluronate, Beta-Glucan, Glycerin, and Glycine Soja (Soybean) Seed Extract. 1. 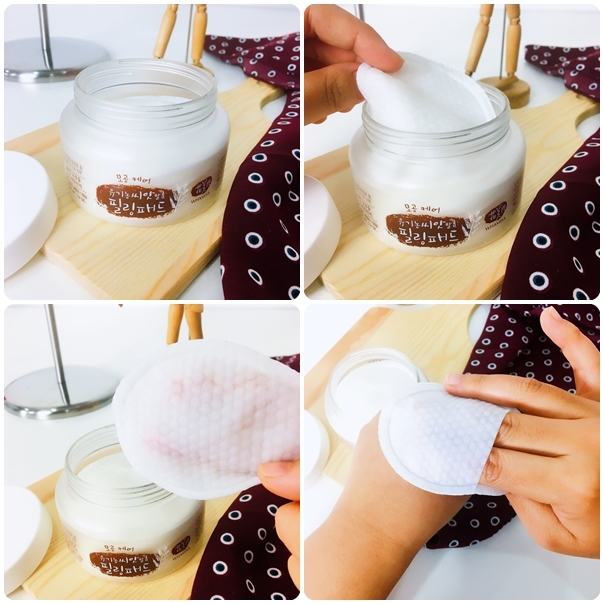 After cleansing, slip fingers into the mitt and gently buff the skin in circular motion. 2. Start from the centre of the face outwards. 4. Put extra effort to massage specific problem area such as the nose. 5. Thoroughly rinse off all remaining residue with warm water. 6. Finish up with toner. I usually use this product around 2-3 times a week, especially on the days where I had heavier makeup than usual. 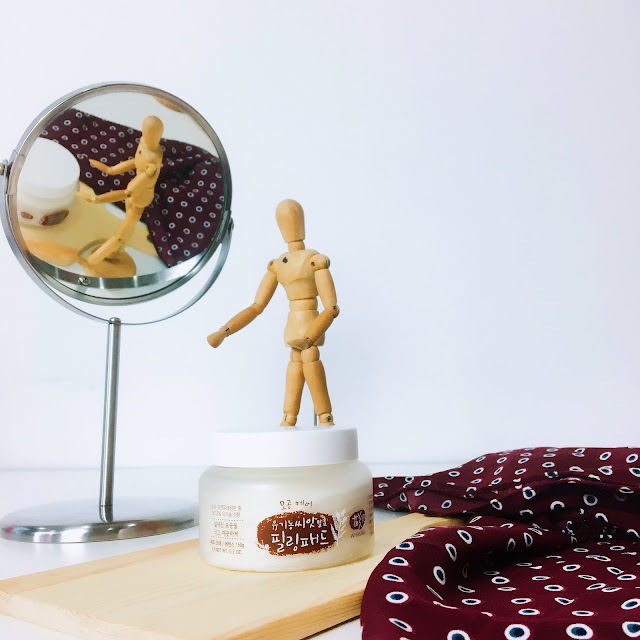 Due to my dry skin, I find it more effective to remove stubborn dirt and dead skin cell. I have to admit this product has a slight alcohol smell that I'm not a fan of which I am guessing a product of the fermentation process that Whamisa uses. It is still bearable though, so the smell doesn't present such a big challenge for me. 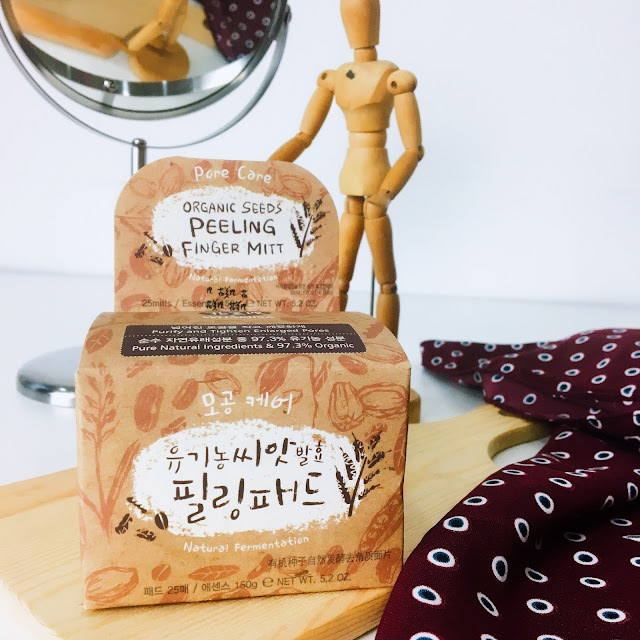 The mitt is soaked enough to cover my whole face + neck so I only need to use one piece of them during my skincare routine (it's recommended to use this at night) which is a plus because I don't think I'll like it very much if I have to use more than one pad at one time. I also often to reach out to this when I feel my skin is especially rough and patchy. After massaging for quite awhile, I actually can feel my skin getting softer. As for the pore control feature, I don't see any noticeable change so far so I guess I need to try use it more to find out. Reason: I find the price slightly higher than others but if you have a sensitive skin that needs an organic solution to it, this product may worth the splurge. I think it'll cost about RM106 on Althea Malaysia website. I only started to get into Asian skincare last year and my skin is really loving the extra boost of hydration that I am getting from multiple toners. I have yet to try anything like this, do you think it's worth the try or just a gimmick? I have my own exfoliating toners which I use almost everyday so I'm not sure if something like this is necessary? It's kinda handy, the pads are already soaked in the peeling toner/essence :) and since the surface of the pads is slightly rougher so for me who tend to have flaky dry skin, this removes them quickly but gentle enough. I don't use them everyday like a toner though, just 2-3 times per week.